It is well known that music has the ability to let people escape from their reality and travel the world without barely moving from their sofa. But, what happened on stage in the intimate and velvety setting of Sands Films in Rotherithe, surprised even the more passionate music lovers. 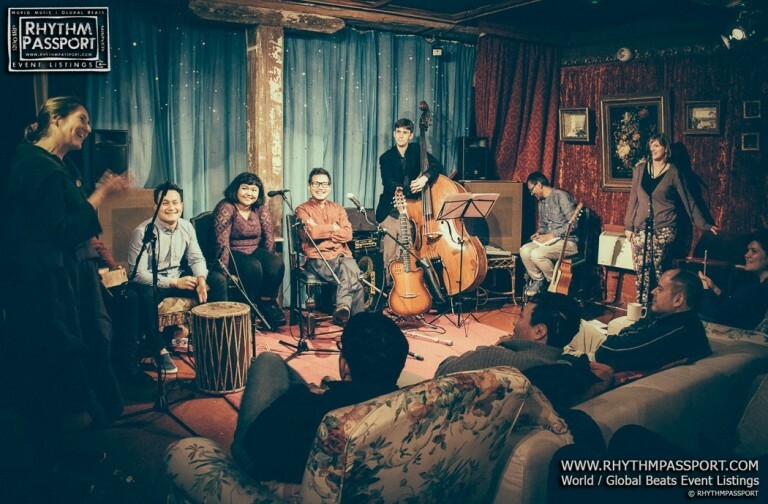 In little more than ninety minutes, the fifty or so lucky listeners attending the gig were led throughout an all-inclusive tour of Nepal, visiting the different cultural regions and listening to their most intrinsic musical expressions. The tour guide was a seven-piece band called Namlo (which is also the name given to the head strap that helps carry weight on the back) formed by close, accomplished good-tempered and always smiling musicians coming not only from Nepal but also Congo, Wales and East London. The different origins and artistic roots were glaringly expressed by the music played by the band. Next to exposing the Nepalese tradition, Namlo’s sound was indeed characterised by a wide range of influences and references, which went from the band leader, singer/songwriter and guitar players (Ganga Thapa) passion for Malian desert blues textures (from Ali Farka Touré to Tinariwen), to the Indian infatuation revealed by Siemy Di (the drummer of the septet). In addition, the performers offered some American bluesy and British folksy arrangements which, despite their Western origins, didn’t sound out of place in the South Asian context.